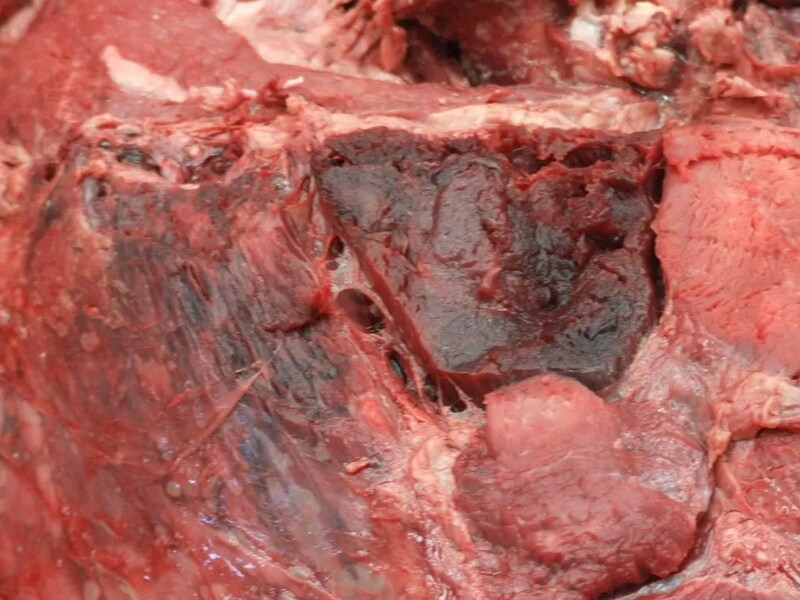 History: A steer was found dead with no prior clinical signs. The farm had 12 animals die (of 550) over the past 10 days. 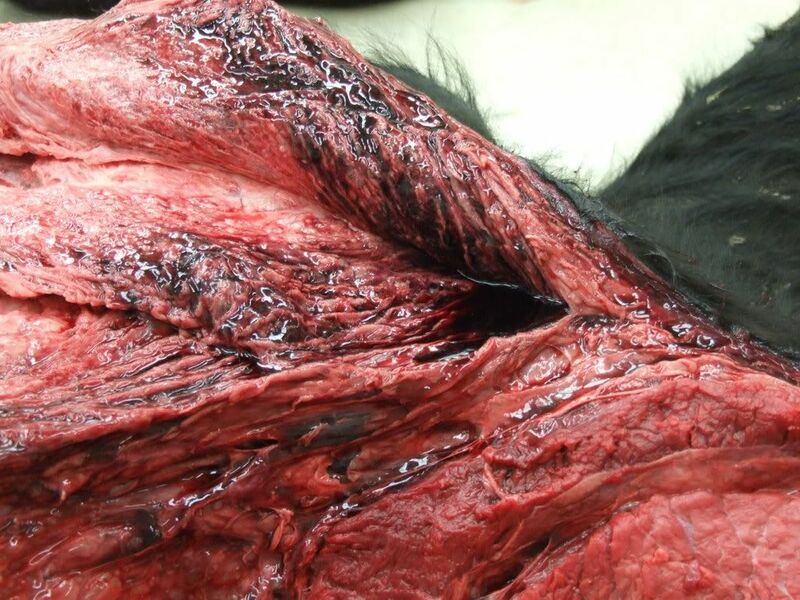 Subcutaneous and muscular emphysema throughout the animal. There was moderate to severe retroperitoneal and mediastinal edema. The hind-limb skeletal muscles had multiple dark red areas and were emphysematous. They had a prominent odor of rancid butter. 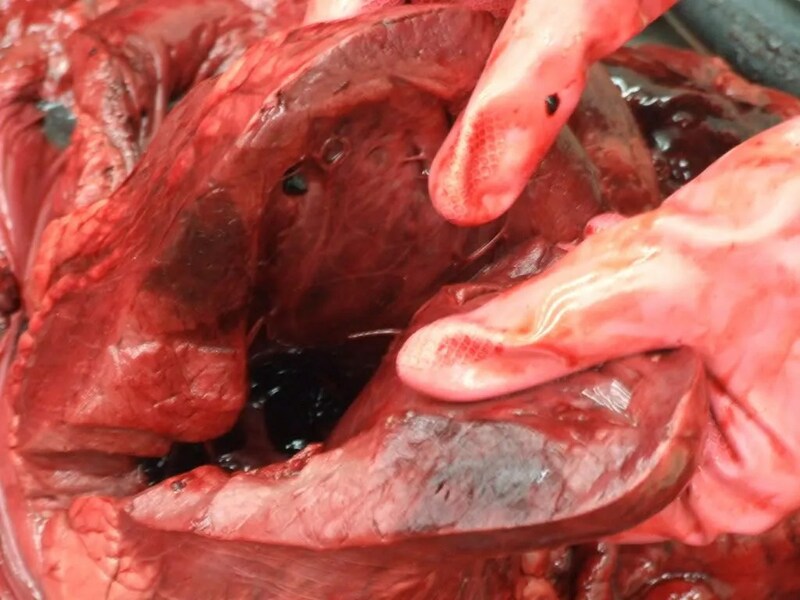 epicardial surface was covered with a large amount of fibrin. The ventricular myocardium and the interventricular septa had multiple dark red areas (approximately 4cm x 3cm x 2 cm). The lungs were diffusely wet and heavy and were adhered by fibrin to the thoracic wall. 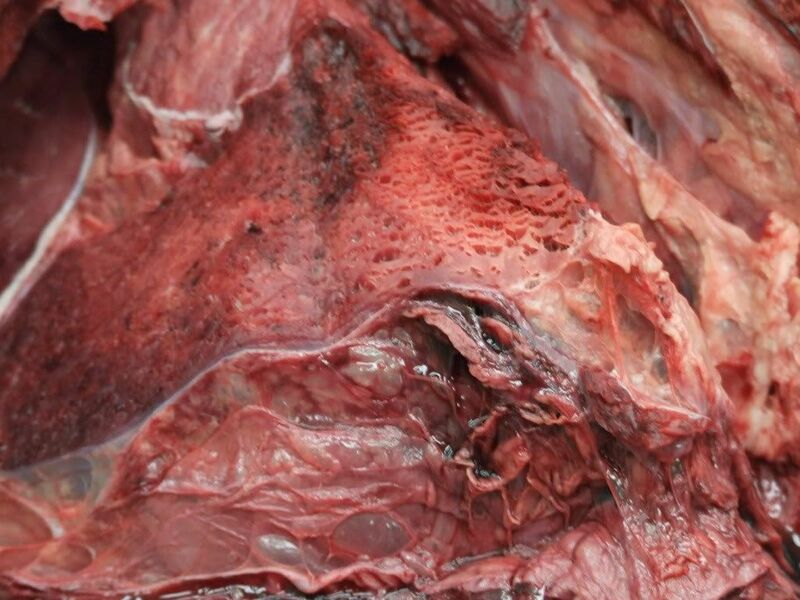 The serosal surface of the rumen was multifocally covered with fibrin. 1. Necrotizing emphysematous myositis and myocarditis, multifocal, severe, with intralesional bacteria. 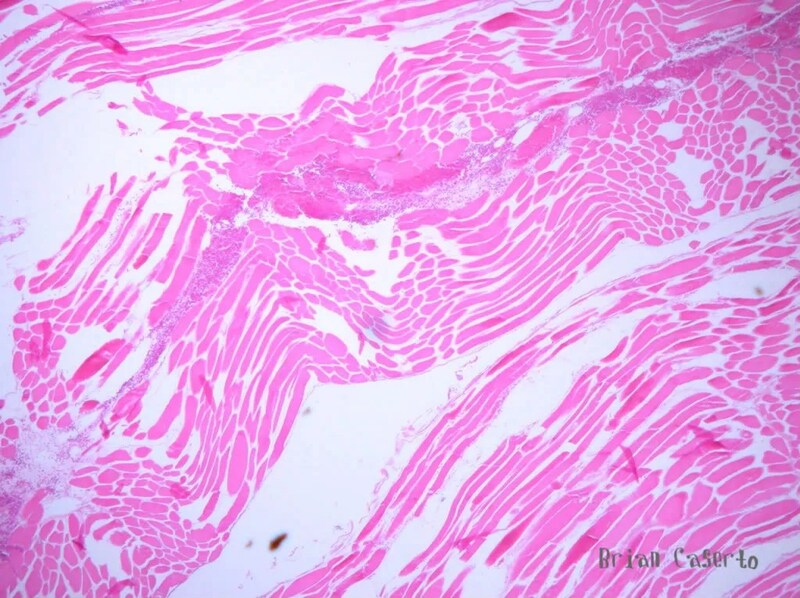 Skeletal muscle: The majority of myocytes are diffusely devoid of nuclei but retain their cross-striations. There are multifocal hemorrhages within the muscle, and scattered foci of edema. Some sections have large clear spaces between myofibers (emphysema), and other sections have small numbers of degenerate neutrophils. There are rare nuclei present. seen. 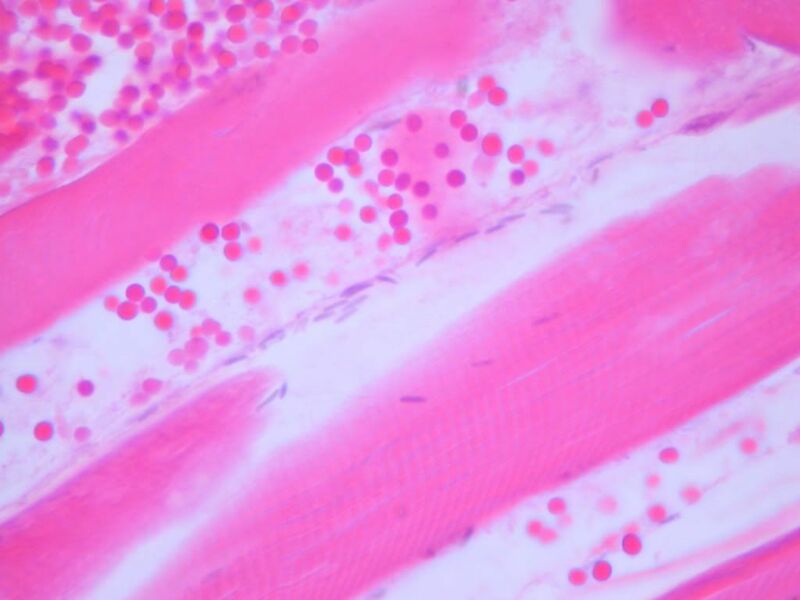 On the epicardial surface is a large aggregation of neutrophils and fibrin. positive for Clostridium chauvoei. The gross and histological lesions confirm this diagnosis. Comment: These cattle were not vaccinated for Clostridium chauvoei. The spores are still viable in the soil and cattle can still become infected if not vaccinated. 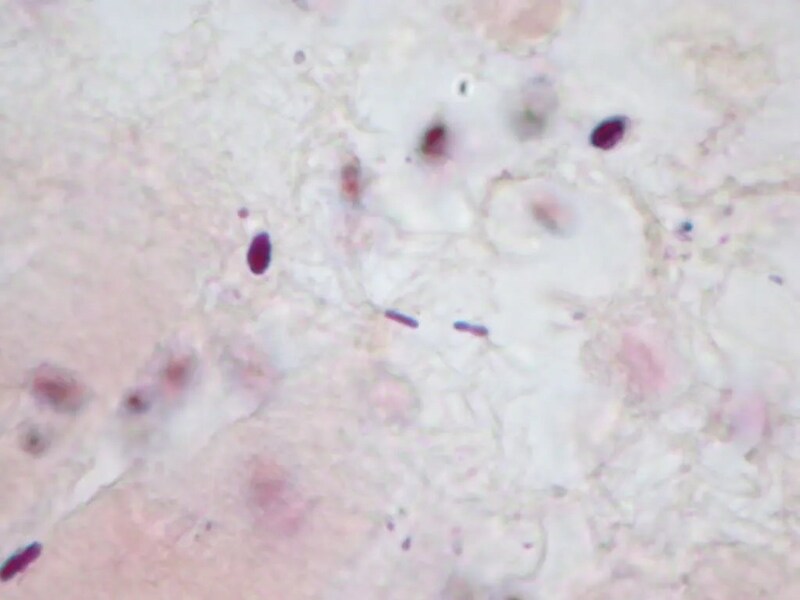 This entry was posted in Necropsy Cases and tagged Bacteria, Bovine, Cardiovascular, Musculoskeletal. Bookmark the permalink.